At C&G's One Hour Heating and Air Conditioning, we offer a complete range of home heat pump installations and repairs. We're Torrington's heat pump experts and are eager to help save you energy by installing a new heat pump in your home. 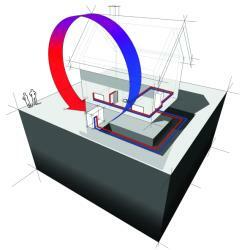 Have an older heat pump that's too noisy or simply not doing the job? Usually an older heat pump simply requires some minor maintenance and adjustment to get back on track. C&G's One Hour Heating and Air Conditioning will gladly restore you older heat pump and get it running in no time. Save money and energy this winter with a new heat pump from C&G's One Hour Heating and Air Conditioning. To schedule a free estimate, please call us!